Researchers at Columbia University have published a new open-access article in Scientific Reports describing a non-invasive gene delivery method for optogenetic experimentation. Lipid microbubble-encapsulated adeno-associated virus (carrying Channelrhodopsin-2 gene) in the blood is introduced into the brain by using transcranial-focused ultrasound (FUS) to transiently breach the blood-brain barrier. Imaging was performed with a Nikon laser scanning confocal microscope. Check out this report about researchers at Cincinnati Children's Hospital Medical Center who successfully created stomach fundus tissue in the lab using human pluripotent stem cells. Their research, published in Nature, demonstrated that the tissue was able to produce stomach acid and digestive enzymes, indicating high potential for use as a model system. Imaging was performed using a Nikon A1Rsi resonant-scanning confocal microscope with spectral detector. Researchers at the UC San Diego and University of Groningen have published an open-access article in PLOS Biology that provides proof for a mechanism of collective resistance in microbial communities via intracellular antibiotic deactivation. Deactivation of the antibiotic chloramphenicol by resistant bacteria dropped the overall concentration in the growth medium to the point that non-resistant bacteria began to proliferate and even outcompete resistant cells. Live cell imaging was performed with a Nikon Ti-E inverted research microscope. We are very excited to announce that the Nikon Imaging Center at Harvard Medical School (NIC@HMS) is seeking candidates for a post-doctoral training fellowship in advanced optical microscopy techniques and core facility management. For more information and to apply, please click on the link. We’re excited about the upcoming 2017 Light Microscopy Facility Managers Meeting in York, UK on January 5th and 6th. The meeting, organized by the Royal Microscopical Society, will focus on a number of topics, including the logistics of running a core facility, as well as the latest technological advances and imaging techniques. We hope to see you there! Researchers at Northwestern University Feinberg School of Medicine have demonstrated that the microRNA-103/107 family regulates macropinocytosis and end-stage autophagy in the stem cell-enriched limbal epithelium of the eye. Their research, published in the Journal of Cell Biology, found that loss of microRNA-103/107 results in dysregulation of macropinocytosis and formation of large vacuoles. In collaboration with Josh Rappoport of the Nikon Imaging Center at Northwestern, vacuole morphology was characterized using the Nikon N-SIM super-resolution system. New open-access research in Scientific Reports details a 3D microwell array system for culturing human tumor cells infected with Kaposi’s sarcoma-associated herpesvirus (KSHV). Cells grown in 3D had higher KSHV genome copy numbers than those grown in 2D control (measured by fluorescence microscopy) and higher rates of lytic reactivation, providing a more physiologically relevant model for infection. Live cell imaging was performed using a Nikon Ti-U inverted fluorescence microscope. 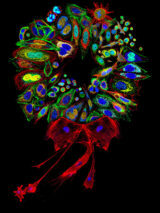 We'd like to get everybody in the holiday spirit by sharing this image from our 2011 Nikon Small World Photomicrography Competition, featuring a collage of fluorescently stained mammalian cells. Photo credit: Dr. Donna Stolz, University of Pittsburgh. Please check out this wonderful open-access article by Rae Nishi, Director of Education at the Marine Biological Laboratory (MBL) in Woods Hole, MA. Dr. Nishi and colleagues discuss the profound impact of the MBL’s research training courses in transforming today’s students into tomorrow’s leading researchers through an intense and collaborative blend of hands-on training and the highest-level instruction. We are very proud to be long-time supporters of the MBL and their research training courses, sharing the common goal of advancing science. Most of us have probably had an overdue library book, but likely not 122 years overdue. This NPR article covers how the headmaster at Hereford Cathedral School received a package containing a copy of Walter Benjamin Carpenter’s The Microscope and Its Revelations that was originally checked out of the school library in 1894. Fortunately the library does not charge late fees. Here’s a news article from Science about recent research using stem cell genes to rejuvenate mice exhibiting symptoms of Hutchinson-Guilford Progeria Syndrome – a genetic disorder resulting in signs of premature aging. Activation of just four genes helped ameliorate several symptoms of old age – helping to thicken skin, reduce deterioration of the kidney and spleen, and improve cardiac function. Nikon Instruments Inc. today unveiled the winners of the sixth annual Nikon Small World in Motion Photomicrography Competition, awarding First Place to William Gilpin of Stanford University for his video depicting an eight-week-old starfish larva churning the water around its body as it searches for food. 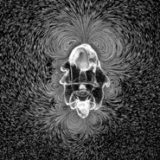 Gilpin and his colleagues studied the starfish larva as a model system for how physics shapes evolution, and were surprised and intrigued that a common organism like a starfish could create such an intricate and unexpected pattern in the water. We hope everyone enjoyed the first day of the Practical Workshop on Advanced Microscopy held at the Nikon Imaging Center at Istituto Italiano Di Tecnologia. Attendees get hands-on experience with many cutting edge imaging technologies, including Nikon’s A1 confocal with spectral detection, N-SIM, N-STORM, and more. The workshop runs through Friday December 16th. Check out this new article in Nature Microbiology detailing the structure of archaellum using cryo electron microscopy. Archaellum are analogous to bacterial flagella (driving cell motility), but found in Archaea. Researchers at UCLA used CryoEM to image archaellum at 3.4 angstrom resolution, finding significant structural differences compared to flagella. Here’s an open-access article in Scientific Reports detailing a new method for co-culture of human induced pluripotent stem cell (iPSC) derived neurons and glial cells in a 96-well microfluidic platform designed for high throughput drug screening and personalized medicine selection. Cells are grown in a 3D extracellular matrix network so as to best mimic in vivo conditions. Nikon is very excited that Florida Atlantic University at Jupiter Brain Institute is now home to the latest Nikon Center of Excellence, one of seven around the world. According to Randy Blakely, executive director of FAU's Brain Institute, "The establishment of a Nikon Center of Excellence at FAU brings a new level of imaging capability to our scientists and trainees, and links our community to prominent cell imaging centers at premier academic institutions and research centers around the world." We would like to invite The American Society for Cell Biology meeting attendees to join us for a Tech Talk by Dr. Steven Finkbeiner – “Using the Past to Predict the Future: Applications of High Throughput Longitudinal Single Cell Analysis to Discovery”. Dr. Finkbeiner will discuss the utility of Robotic Microscopy for longitudinal single cell imaging and analysis and how it can be used to produce quantitative and predictive models of biology. The Tech Talk will be held Tuesday December 6th in Theater 1, Room 102 of the Moscone Center from 12:00-12:45 PM. Researchers have developed fluorescent cell-permeable “super-binding” peptides for specific labeling of gephyrin - a marker of the inhibitory postsynaptic density - demonstrating conventional and super-resolution imaging of inhibitory postsynaptic sites for the first time. These peptides also act as modulators of inhibitory neurotransmission. The authors hope to expand the desigin and use of fluorescent “super-binding” peptides to other cellular targets. Check out our new application note in Nature Methods discussing how the Nikon Ti2 inverted research microscope is ideally suited to high content imaging applications. The unprecedented 25 mm field of view of the Ti2 (camera port) provides about a two-fold improvement in imaging area over its predecessor, drastically increasing system throughput and speeding up discovery. We hope everybody is excited about the upcoming The American Society for Cell Biology annual meeting being held at San Francisco’s Moscone Center. Please join us at Booth 623 from December 4-6 to see our new Ti2 inverted microscope and other exciting imaging solutions.